The Peace of Westphalia (German: Westfälischer Friede) was a series of peace treaties signed between May and October 1648 in the Westphalian cities of Osnabrück and Münster, largely ending the European wars of religion, including the Thirty Years' War. The treaties of Westphalia brought to an end a calamitous period of European history which caused the deaths of approximately eight million people. Scholars have identified Westphalia as the beginning of the modern international system, based on the concept of Westphalian sovereignty, though this interpretation has been seriously challenged. The negotiation process was lengthy and complex. Talks took place in two different cities, as each side wanted to meet on territory under its own control. A total of 109 delegations arrived to represent the belligerent states, but not all delegations were present at the same time. 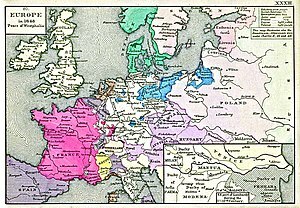 Three treaties were signed to end each of the overlapping wars: the Peace of Münster, the Treaty of Münster, and the Treaty of Osnabrück. These treaties ended the Thirty Years' War (1618–1648) in the Holy Roman Empire, with the Habsburgs and their Catholic allies on one side, battling the Protestant powers (Sweden, Denmark, Dutch, and Holy Roman principalities) allied with France (Catholic but anti-Habsburg). The treaties also ended the Eighty Years' War (1568–1648) between Spain and the Dutch Republic, with Spain formally recognising the independence of the Dutch. The Peace of Westphalia established the precedent of peace established by diplomatic congress. A new system of political order arose in central Europe, based upon peaceful coexistence among sovereign states. Inter-state aggression was to be held in check by a balance of power, and a norm was established against interference in another state's domestic affairs. As European influence spread across the globe, these Westphalian principles, especially the concept of sovereign states, became central to international law and to the prevailing world order. Peace negotiations between France and the Habsburgs began in Cologne in 1641. These negotiations were initially blocked by Cardinal Richelieu of France, who insisted on the inclusion of all his allies, whether fully sovereign countries or states within the Holy Roman Empire. In Hamburg and Lübeck, Sweden and the Holy Roman Empire negotiated the Treaty of Hamburg with the intervention of Richelieu. The Holy Roman Empire and Sweden declared the preparations of Cologne and the Treaty of Hamburg to be preliminaries of an overall peace agreement. The main peace negotiations took place in Westphalia, in the neighboring cities of Münster and Osnabrück. Both cities were maintained as neutral and demilitarized zones for the negotiations. In Münster, negotiations took place between the Holy Roman Empire and France, as well as between the Dutch Republic and Spain. Münster had been, since its re-Catholicisation in 1535, a strictly mono-denominational community. It housed the Chapter of the Prince-Bishopric of Münster. Only Roman Catholic worship was permitted, while Calvinism and Lutheranism were prohibited. Sweden preferred to negotiate with the Holy Roman Empire in Osnabrück, controlled by the Protestant forces. Osnabrück was a bidenominational Lutheran and Catholic city, with two Lutheran churches and two Catholic churches. The city council was exclusively Lutheran, and the burghers mostly so, but the city also housed the Catholic Chapter of the Prince-Bishopric of Osnabrück and had many other Catholic inhabitants. Osnabrück had been subjugated by troops of the Catholic League from 1628 to 1633 and then taken by Lutheran Sweden. 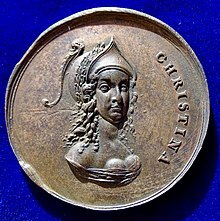 The reverse of this medal: Christina of Sweden as Minerva standing left, holding an olive branch in her left arm, and grasping the tree of knowledge with her right hand. The peace negotiations had no exact beginning and ending, because the 109 delegations never met in a plenary session. Instead, various delegations arrived between 1643 and 1646 and left between 1647 and 1649. The largest number of diplomats were present between January 1646 and July 1647. Delegations had been sent by 16 European states, 66 Imperial States representing the interests of 140 Imperial States, and 27 interest groups representing 38 groups. The French delegation was headed by Henri II d'Orléans, Duke of Longueville and further comprised the diplomats Claude d'Avaux and Abel Servien. The Swedish delegation was headed by Count Johan Oxenstierna and was assisted by Baron Johan Adler Salvius. In Münster, Johann Ludwig von Nassau-Hadamar and Isaak Volmar. In Osnabrück, Johann Maximilian von Lamberg and Reichshofrat Johann Krane. The Spanish delegation was headed by Gaspar de Bracamonte y Guzmán, and notably included the diplomats and writers Diego de Saavedra Fajardo, and Bernardino de Rebolledo. The Franche Comté and the Spanish Netherlands were represented by Antoine Brun. the Venetian envoy Alvise Contarini acted as mediators. Various Imperial States of the Holy Roman Empire also sent delegations. Brandenburg sent several representatives, including Vollmar. The Dutch Republic sent a delegation of six, including two delegates from the province of Holland (Adriaan Pauw) and Willem Ripperda from one of the other provinces; two provinces were absent. The Swiss Confederacy was represented by Johann Rudolf Wettstein. Three separate treaties constituted the peace settlement. The Peace of Münster was signed by the Dutch Republic and the Kingdom of Spain on 30 January 1648, and was ratified in Münster on 15 May 1648. The Treaty of Osnabrück (Instrumentum Pacis Osnabrugensis, IPO), between the Holy Roman Empire and Sweden, along with their respective allies. A map of 1884 showing European borders in 1648. Holy Roman Empire in 1648. The power asserted by Ferdinand III was stripped from him and returned to the rulers of the Imperial States. The rulers of the Imperial States could henceforth choose their own official religions. Catholics and Protestants were redefined as equal before the law, and Calvinism was given legal recognition as an official religion. The independence of the Dutch Republic, which practiced religious toleration, also provided a safe haven for European Jews. The Holy See was very displeased at the settlement, with Pope Innocent X calling it "null, void, invalid, iniquitous, unjust, damnable, reprobate, inane, empty of meaning and effect for all time" in the bull Zelo Domus Dei. 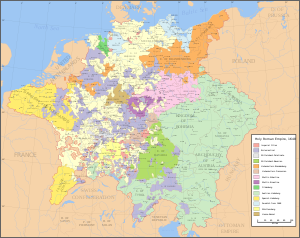 All parties would recognize the Peace of Augsburg of 1555, in which each prince would have the right to determine the religion of his own state (the principle of cuius regio, eius religio). The options were Catholicism, Lutheranism, and now Calvinism. Christians living in principalities where their denomination was not the established church were guaranteed the right to practice their faith in private, as well as in public during allotted hours. It is often argued that the Peace of Westphalia resulted in a general recognition of the exclusive sovereignty of each party over its lands, people, and agents abroad, and responsibility for the warlike acts of any of its citizens or agents, however, this view has been challenged. Issuance of unrestricted letters of marque and reprisal to privateers was forbidden. Switzerland was formally recognised as independent from the Holy Roman Empire, after decades of de facto independence. The Dutch Republic, which had declared its independence from Spain in 1581, was formally recognised as an fully independent state from both Spain and the Holy Roman Empire. France retained the Bishoprics of Metz, Toul and Verdun near Lorraine, received the cities of the Décapole in Alsace (except for Strasbourg, the Bishopric of Strasbourg, and Mulhouse) and the city of Pignerol near the Spanish Duchy of Milan. To escape incorporation into Swedish Bremen-Verden, the city of Bremen had claimed Imperial immediacy. The emperor had granted this request and separated the city from the surrounding Bishopric of Bremen. Sweden launched the Swedish-Bremen wars in 1653/54 in a failed attempt to take the city. The treaty did not decide the Swedish-Brandenburgian border in the Duchy of Pomerania. At Osnabrück, both Sweden and Brandenburg had claimed the whole duchy, which had been under Swedish control since 1630 despite legal claims of Brandenburgian succession. While the parties settled for a border in 1653, the underlying conflict continued. The treaty ruled that the Dukes of Mecklenburg, owing their re-investiture to the Swedes, cede Wismar and the Mecklenburgian port tolls. While Sweden understood this to include the tolls of all Mecklenburgian ports, the Mecklenburgian dukes as well as the emperor understood this to refer to Wismar only. Wildeshausen, a petty exclave of Bremen-Verden and fragile basis for Sweden's seat in the Westphalian circle diet, was also claimed by the Bishopric of Münster. Bavaria retained the Palatinate's vote in the Electoral College of the Holy Roman Empire, which it was granted by the imperial ban on the Elector Palatine Frederick V in 1623. The Prince Palatine, Frederick's son, was given a new, eighth electoral vote. The Palatinate was divided between the re-established Elector Palatine Charles Louis (son and heir of Frederick V) and Elector-Duke Maximilian of Bavaria, and thus between the Protestants and Catholics. Charles Louis obtained the Lower Palatinate, along the Rhine, while Maximilian kept the Upper Palatinate, to the north of Bavaria. Brandenburg-Prussia received Farther Pomerania, and the Bishoprics of Magdeburg, Halberstadt, Kammin, and Minden. The succession to the Jülich-Cleves-Berg, whose last duke had died in 1609, was clarified. Jülich, Berg, and Ravenstein were given to the Count Palatine of Neuburg, while Cleves, Mark, and Ravensberg went to Brandenburg. The Prince-Bishopric of Osnabrück would alternate between Catholic and Lutheran bishops, with the Protestant bishops chosen from the cadets of the House of Brunswick-Lüneburg. Barriers to trade and commerce erected during the war were abolished, and "a degree" of free navigation was guaranteed on the Rhine. 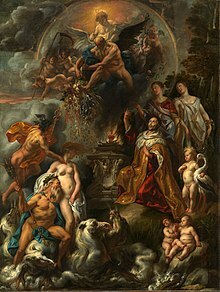 Allegory of the Peace of Westphalia, by Jacob Jordaens. The treaties did not entirely end conflicts arising out of the Thirty Years' War. Fighting continued between France and Spain until the Treaty of the Pyrenees in 1659. The Dutch-Portuguese War had begun during the Iberian Union between Spain and Portugal, as part of the Eighty Years' War, and went on until 1663. Nevertheless, the Peace of Westphalia did settle many outstanding European issues of the time. Scholars of international relations have identified the Peace of Westphalia as the origin of principles crucial to modern international relations, including the inviolability of borders and non-interference in the domestic affairs of sovereign states. This system became known in the literature as Westphalian sovereignty. Although scholars have challenged the association with the Peace of Westphalia, the debate is still structured around the concept of Westphalian sovereignty. ^ Clodfelter, Michael (2017). Warfare and Armed Conflicts: A Statistical Encyclopedia of Casualty and Other Figures, 1492–2015. McFarland. p. 40. ISBN 978-0786474707. ^ a b Osiander, Andreas (2001). "Sovereignty, International Relations, and the Westphalian Myth". International Organization. 55 (2): 251–287. ^ a b Henry Kissinger (2014). "Introduction and Chpt 1". World Order: Reflections on the Character of Nations and the Course of History. Allen Lane. ISBN 0241004268. ^ Croxton, Derek (2013). Westphalia: The Last Christian Peace. Palgrave. ISBN 9781137333322. ^ a b Schiller, Frederick. "The Thirty Years War, Complete". ^ Konrad Repgen, 'Negotiating the Peace of Westphalia: A Survey with an Examination of the Major Problems', In: 1648: War and Peace in Europe: 3 vols. (Catalogue of the 26th exhibition of the Council of Europe, on the Peace of Westphalia), Klaus Bußmann and Heinz Schilling (eds.) on behalf of the Veranstaltungsgesellschaft 350 Jahre Westfälischer Friede, Münster and Osnabrück: no publ., 1998, 'Essay Volume 1: Politics, Religion, Law and Society', pp. 355–72, here pp. 355 seq. ^ Konrad Repgen, "Negotiating the Peace of Westphalia: A Survey with an Examination of the Major Problems", In: 1648: War and Peace in Europe: 3 vols. (Catalogue of the 26th exhibition of the Council of Europe, on the Peace of Westphalia), Klaus Bußmann and Heinz Schilling (eds.) on behalf of the Veranstaltungsgesellschaft 350 Jahre Westfälischer Friede, Münster and Osnabrück: no publ., 1998, 'Essay Volume 1: Politics, Religion, Law and Society', pp. 355–372, here p. 356. ^ Sonnino, Paul (30 June 2009). Mazarin's Quest: The Congress of Westphalia and the Coming of the Fronde. Harvard University Press. ISBN 9780674043862. ^ "Original text in Dutch National Archives". beeldbank.nationaalarchief.nl. ^ "Digital German text Treaty of Münster". lwl.org. ^ "Digital German text Treaty of Osnabrück". lwl.org. Retrieved 13 May 2017. ^ a b Barro, R. J. & McCleary, R. M. "Which Countries have State Religions?" (PDF). University of Chicago. p. 5. Retrieved 7 November 2006. ^ "This day, Mary 15, in Jewish history". Cleveland Jewish News. ^ The incipit of this bull, meaning "Zeal of the house of God", quotes from Psalm 69:9: "For the zeal of thine house hath eaten me up, and the reproaches of them that reproached thee are fallen upon me." ^ Larry Jay Diamond; Marc F. Plattner; Philip J. Costopoulo (2005). World religions and democracy. p. 103. ^ Böhme, Klaus-R (2001). "Die sicherheitspolitische Lage Schwedens nach dem Westfälischen Frieden". In Hacker, Hans-Joachim (ed.). Der Westfälische Frieden von 1648: Wende in der Geschichte des Ostseeraums (in German). Kovač. p. 35. ISBN 3-8300-0500-8. ^ Böhme (2001), p. 36. ^ Böhme (2001), p. 37. ^ a b c Böhme (2001), p. 38. ^ Gross, Leo (1948). "The Peace of Westphalia, 1648–1948". American Journal of International Law. 42 (1): 20–41 [p. 25]. doi:10.2307/2193560. ^ Osiander, Andreas (2001). "Sovereignty, International Relations, and the Westphalian Myth". International Organization. 55 (2): 251–287. doi:10.1162/00208180151140577. ISSN 1531-5088. Croxton, Derek, and Anuschka Tischer. The Peace of Westphalia: A Historical Dictionary (Greenwood Publishing Group, 2002). Croxton, Derek (1999). "The Peace of Westphalia of 1648 and the Origins of Sovereignty". International History Review. 21 (3): 569–591. doi:10.1080/07075332.1999.9640869. Schmidt, Sebastian (2011). "To Order the Minds of Scholars: The Discourse of the Peace of Westphalia in International Relations Literature1". International Studies Quarterly. 55 (3): 601–623. doi:10.1111/j.1468-2478.2011.00667.x. Historiography. 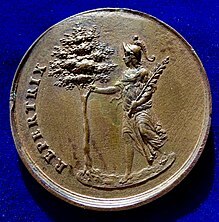 Wikimedia Commons has media related to Peace of Westphalia. Wikisource has the text of a 1911 Encyclopædia Britannica article about Peace of Westphalia.